Today’s Options will become Tomorrow’s Requirements! Entrepreneurs play a critical role in the starting and establishing small business opportunities in Africa. However, a number of newly-established ventures in developing economies fade out in the early stage of business, within 42 months. There are multi-prong challenges including access to information and new skills which contribute to this failure. In response to these challenges, the University of Ghana Business School, Ghana, and The PearlRichards Foundation (www.pearlrichards.org), Ghana organized the 2010 Ghana Internet and Mobile Entrepreneurs’ Forum (GIMEF 2010). The event was co-sponsored by CitiFM, Craft Concepts, Promasidor Ghana, and PC Tech Magazine, Uganda. The forum convener, Dr. Richard Boateng, explained that the forum was birthed from a graduate MBA class project aimed at creating a space for interaction and learning between students and real world technology entrepreneurs. The theme was “Building Ghana through Internet Enterprises and Mobile innovations”. 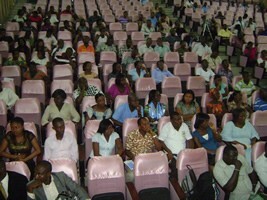 The forum took place at the University of Ghana Business School. An audience of up 180 students, researchers, lecturers, practitioners and entrepreneurs had an opportunity to share, discuss and learn from individual career experiences and profiles of Ghanaian Internet and Mobile entrepreneurs.